Imagine getting a Facebook message from a stranger saying, “I’d like to interview you for my blog”. I honestly cannot get over that people ever write me back. Unbelievable or not however, that is the beginning of this story. She agreed to an interview, so let me introduce you to Manon Whittom, the next Ms New Brunswick in our series. I first heard about Manon when a friend sent me a news article about her store, Terraterre, the very first zero-waste grocery store in Atlantic Canada. Located in Edmundston, Manon Whittom is the woman behind the concept and immediately I was intrigued. I love the idea of reducing our consumption, I love supporting small businesses, and I was very curious to know how a store like this would do in a place like Edmundston. It really is such a great idea, and if it works there, surely we will start to see more of them in the province. 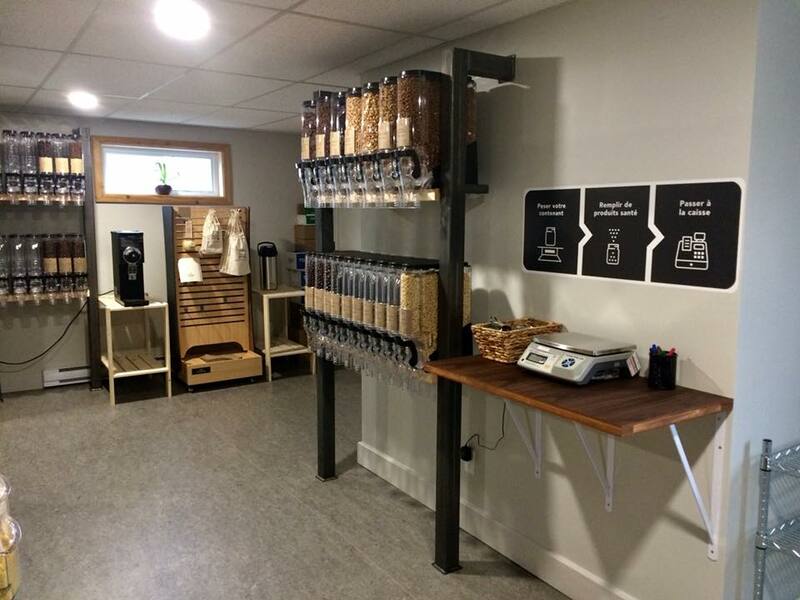 Terraterre is the first zero waste store in Atlantic Canada where customers are invited to buy in bulk. They bring their own containers, or can purchase reusable containers here if they don’t have any. They fill up with what they want, we weigh it and that’s it. I offer nearly 200 different products right now including dry goods like nuts, dried fruits, grains, flour, sprouts, rice, coffee, tea, soaps, detergents, maple syrup products and even body products like shampoo and body wash. I even have nut butter machines for fresh almond, or seed butter! And almost everything we sell is organic, fair-trade or local. So you support other local businesses as well? Yes. As much as I can, I try to buy locally (within New Brunswick). That is important to me. No, right now I am the only one who works there, but my kids will help out after school and my husband helps on the weekends to refill some of the containers because it can be quite heavy for me to do. I’m pregnant right now, so I will be looking to hire someone when the baby comes. 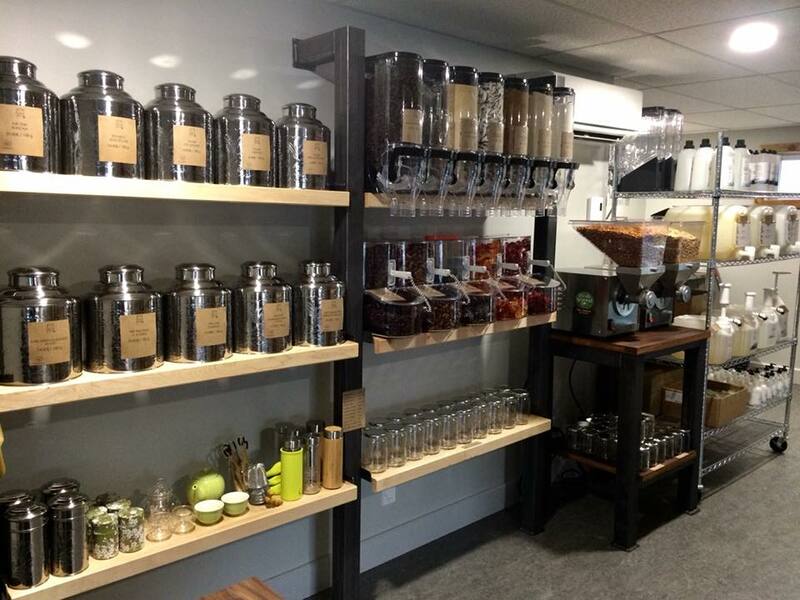 What made you want to open a zero-waste store? For my whole life I hated putting things in the trash. I always wanted a store like this to open, and eventually I started to think that I should do something. I had seen a store with a similar concept on a trip to Montreal, and I really wished we had something like that in my community. I have always been passionate about the environment, and I really feel that this is a way that I can help to take care of it. It is so important. Last year, we tried to eliminate packaging and plastic waste in our home after reading Bea Johnson’s book, “Zero Waste Home”. We found it was extremely difficult, and nearly impossible. It is so hard to buy anything without packaging. Packaging now makes up about 50% of what is in the landfills, and the oceans are full of plastic. We know now that in the next decade or so plastic will become a permanent part of the food chain and that doesn’t seem right. We can all do something to help, and this is my way of helping. I am offering people an opportunity to shop zero-waste so that they can make changes in their homes and lifestyle like I wanted to. Yes, very supportive. We have been open since November and already I have repeat customers I recognize. They are very happy and leave me excellent feedback. I also received incredible training with the Community Business Development Corporation (CBDC). I had no experience in retail before this, as I was a teacher beforehand. They provided me with marketing and accounting training. They also set me up with La Ruche/Hive Edmundston, an organization which mentors small and new businesses. I feel like I have a lot to learn in this area. My brain is just always focused on the store. I am only open four days a week, Wednesday to Saturday which is working really well for me right now. I use the other days to be with my family and relax a bit. I also catch up with product and supply orders, accounting and other back-end things that all businesses have to deal with. My family does help me with the store, especially my husband, and the kids like to be there to play with the register but I hope that with time I will get better at balancing everything. Well first I would say don’t hesitate. If you have an idea, go for it. I would also encourage you to be smart in your decisions. I had many business ideas over the years, and my husband always told me to make a business plan. Some plans seem like a good idea until you work them out and then you realize they’re not. This was the first one that really felt good, even after I planned it all out. Where are you located and how can people get in touch with you? Terraterre is located in the Saint-Jacques area of Edmundston, at 121 rue Principale. We have a Facebook page where people can learn more about us and get updates on new products. They can message us there, or phone the store at 506-253-9274. I could not love this idea more. When I mentioned to Manon that I hoped her idea caught on and others followed in her footsteps, she said she has already received many calls from women looking to do the same thing. 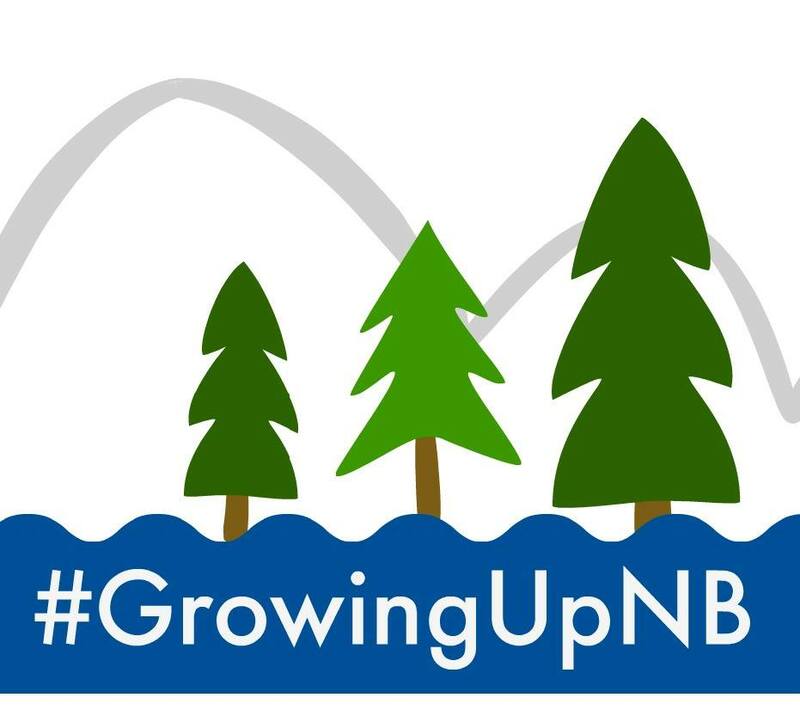 I love that a woman from Northern NB was the first one brave enough to do something this innovative and important, and I am thrilled that her community had the resources to help educate her on how to get started with her business. Manon felt called to action. She was compelled by her deep love and respect for the environment to help others live in a more sustainable way. This is a great example of how important some people’s work is to them. So often we think of work as something we do for an income, but every woman I have talked with so far has so much more motivating them. They love what they do, even (and possibly especially) when it’s hard to do. Manon inspired me to think more about the packaging that my home consumes, and I am committed to making a change in our home. I will be doing some sort of challenge for February, which I will invite everyone to join (details to come), but in the meantime I will be doing some research and making some easy changes in our house. I will keep you posted on some things that you can do, too. And if I am ever in Edmundston, you can bet I will be shopping at Terraterre! I desperately want one of her tote bags (is her logo not the best?! ).